Being one of the lucky few who managed to bag the limited Ming Watches 17.01 - their maiden product - I was even happier having gotten the opportunity to try out their follow-on product - the 17.03. 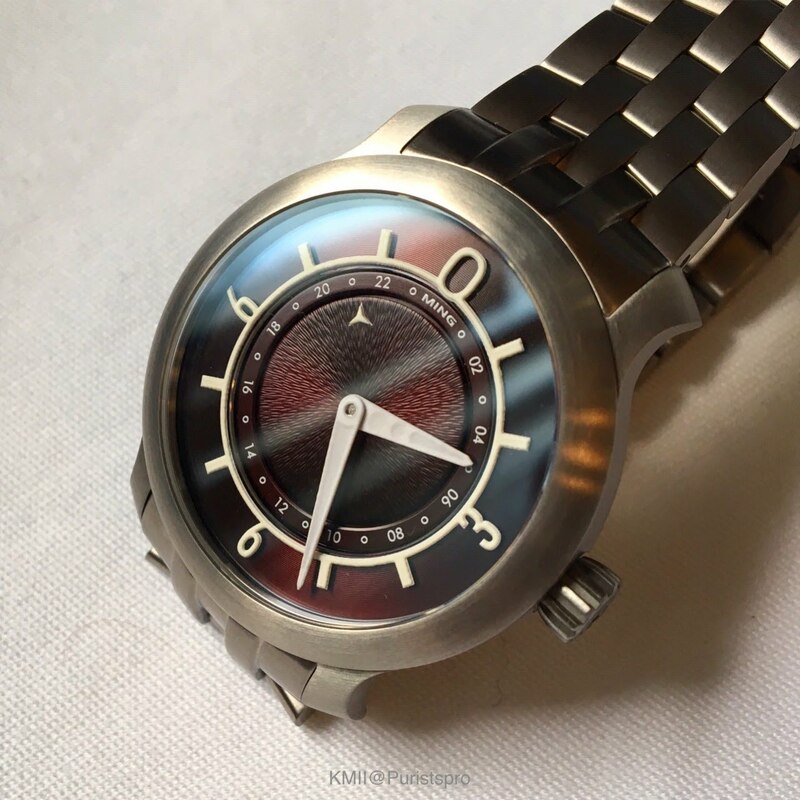 Switching to Grade 2 brushed titanium (the 17.01 was polished Grade 5) - giving it a sportier overall appearance - it adds a titanium bracelet, a switch from hand winding to an automatic movement and a GMT complication, to make it something of a universally usable piece. Like with the 17.01, two dial versions are on offer - this time a burgundy one and a black one. Both still use the three layer sapphire sandwich construction with different rings. The burgundy one has a wonderfully patterned sunburst central section, which doubles as the GMT hour disc. The pattern of the black dial version is much more subdued and subtle in comparison. Where with the 17.01 it has been the anthracite that was easier to photograph due to its dial, I would assume the role going to the burgundy one here. 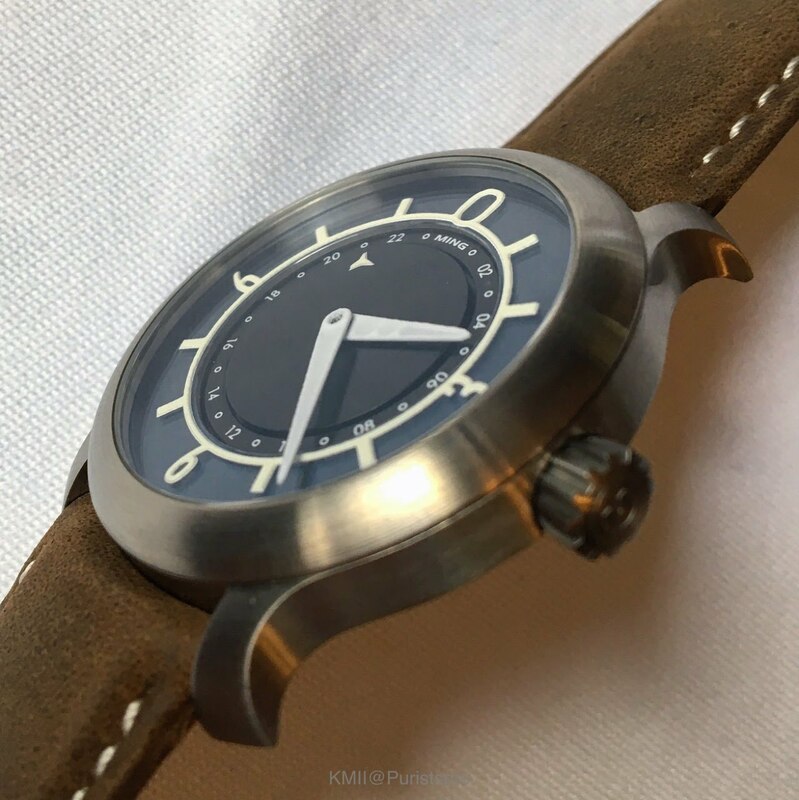 The case design closely follows the 17.01 for a family look but offers slightly altered lugs (necessary to fit both the quick fit straight pins for the bracelet and the curved ones for the straps), and a brushed finish throughout. It remains refreshingly compact in size at 38 x 9,8mm and the case material ensures that it is pleasantly light (49g on a strap and 102g on a bracelet). The movement has been changed to an automatic Sellita SW330-1 Top Grade. While not quite as spectacular as the Schwarz Etienne of the impending Ming 19.01, it offers robust specs and includes hacking, which is a nice touch for a watch without a seconds hand. In terms of functionality the main change is the addition of a second time zone indication via a central disc. In addition to this several details have been upgraded compared to the 17.01. The lume on the hands and hour indicator ring is now much stronger and the straps that get delivered in addition to the bracelet are of a higher spec. Luckily these still come with a pin buckle and a quick change mechanism each and can be sourced separately for the older model. The bracelet is a gem, too. Very comfortable, with an easy to use quick change mechanism and straight forward adjustment it certainly offers an excellent additional feature for the watch. Especially if you are traveling to warm and humid climates or plan to swim with it - the 100m WR should certainly suffice for that. 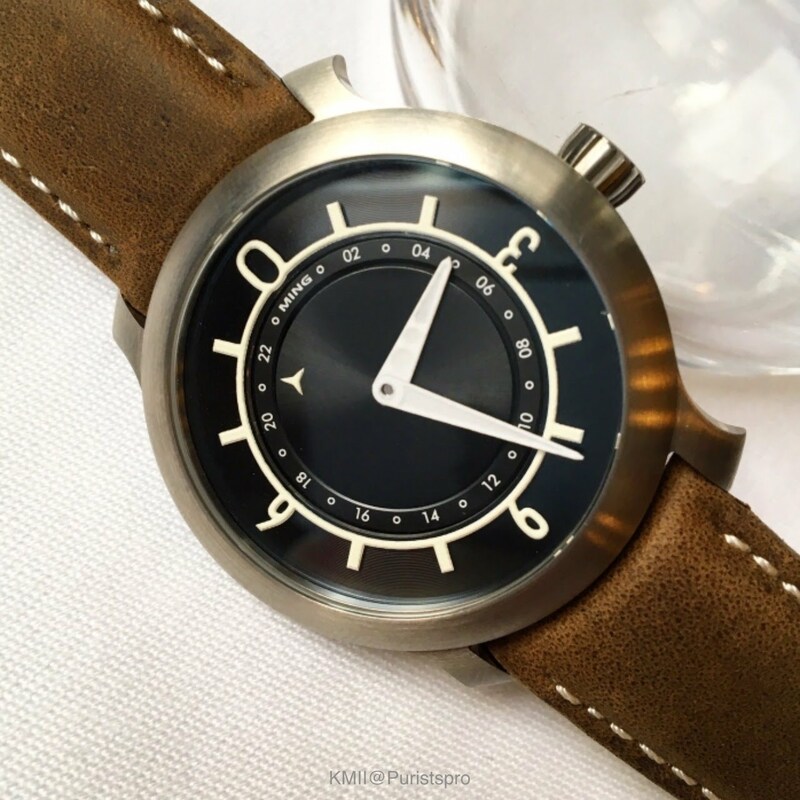 Overall I would say the watch offers a testament to Ming not having been a fry in the pan but that it’s on the way to becoming a serious small scale independent brand. The watch should be much more than a consolation prize for those who missed out on the ‘gone in 60 seconds’ 17.01s and it’s a great go anywhere, do anything piece. And it continues offering a slightly different take on horology, which can only be a good thing. You get both anyway... A bracelet and two straps are part of the package. Glad if the review was helpful, Alkiro!